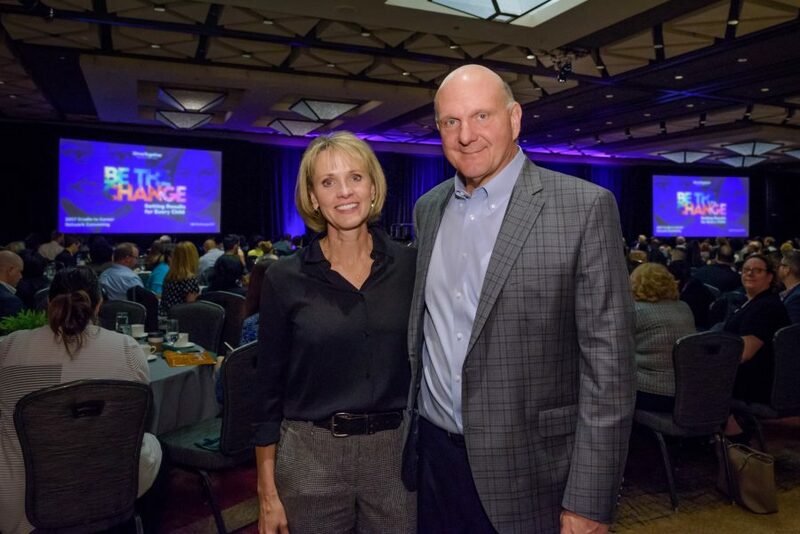 Today, Connie and Steve Ballmer, co-founders of Ballmer Group, announced a major investment in the StriveTogether Cradle to Career Network. The announcement was made at the conclusion of Steve Ballmer’s morning plenary remarks in front of more than 400 community leaders representing local community-based partnerships across the country. The investment includes $10 million per year over the next six years to create a challenge fund to accelerate partner progress, as well as funding to propel the StriveTogether’s new strategic plan. The investment does not come lightly, as Steve demonstrated this morning. He described the decision within the context of a 15-year journey, spearheaded in part by Connie Ballmer, whose early philanthropic work focused on improving systems that support foster children. Upon Steve’s retirement from his position as CEO of Microsoft three years ago, Steve and Connie have focused their philanthropic efforts on the idea that every child born in the U.S. deserves an opportunity to access the American dream. Together, they explored the most impactful role that philanthropy could play to improve economic mobility for children and families. Steve and Connie decided to pursue partnerships with government at all levels to promote the most effective use of tax dollars to help children and families, as well as support efforts to increase the use of data and technology to drive decision making and improve outcomes at the local, state and national levels. Although philanthropy will never match the federal government’s $1.3 trillion in funding for economic mobility for families, it can play a supporting role by taking risks on new approaches and encouraging innovation. They discovered the critical role of “whole child health” and the negative impact of adverse childhood experiences — factors like abuse, domestic violence and the loss of a parent — on a child’s future economic trajectory. And they learned about the way that community-based partnerships like the StriveTogether national network can work to not only improve educational outcomes but open access to broader opportunity for every child, cradle to career. In his opinion, the progress has been due in part to the 360-degree view of a child’s development that the Network has taken, building community partnerships with parents and families, business and faith institutions, P-12 and community colleges, health providers and other nonprofits to mobilize whole communities around all stages of child development. He quipped, “It’s the community, stupid,” as he highlighted the fact that only a community can solve a community’s problems, and the work to facilitate and steward these local partnerships is an essential lever of change in the lives of children. This investment will fund StriveTogether’s new and ambitious comprehensive plan to improve outcomes and reduce racial and socioeconomic disparities in communities across the country. The strategic plan launch was formally announced Monday, October 2. Christian Motley is the senior manager of policy and partnerships for StriveTogether. In this role, he provides leadership on collaborations, coalitions and advocacy strategy. Christian develops resources to align policy priorities, strengthen coalitions and mobilize stakeholders for policy solutions to accelerate partnership progress across the Cradle to Career Network. Indicative of the important work that StriveTogether is doing!